Onscreen or off it, Kajol's child-like smile can surely light up anyone's mood and thanks to Mahesh Bhatt, we got to see that again. Kajol recently posted a collage of pictures featuring her with Mahesh Bhatt on Twitter and wrote, "Funny riveting and generous! All rolled in one! Thank you Bhatt sahab." The Dilwale actress can be seen cuddling the Mr Bhatt in the pictures. Twitter was smitten by Kajol's smile, "Your smile is our medicine ma'am" and "Your laughter is so engaging and real...," read two of the comments posted on her post. In response to Kajol's post, Mahesh Bhatt tweeted: "The magic is you! The moments we spent together on the sets Eela will flicker in my memory for a long, long time. This film is going to be a game changer." Kajol's 1998 film Dushman, where she played the role of twin sisters - Sonia and Naina - was produced by Mahesh Bhatt. The magic is YOU! The moments we spent together on the sets EELA will flicker in my memory for a long , long time. This film is going to be a game changer. 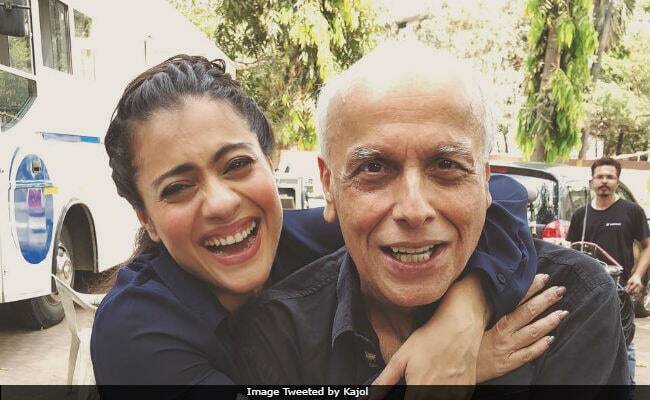 Mahesh Bhatt also posted a picture of him with Kajol on his Instagram and wrote, "Laughter is the sound of the soul dancing! Thank you for this memorable experience." Back in 2014, Mahesh Bhatt had called Kajol an 'overrated' actress during a question-answer segment on Koffee With Karan. Laughter is the sound of the soul dancing! Thank you for this memorable experience. Kajol's upcoming film Eela is helmed by director Pradeep Sarkar and is an official adaptation of Anand Gandhi's Gujarati play, Beta Kaagdo. The plotline of the film revolves around a single mother played by Kajol and her bond with her son. Eela also stars Neha Dhupia and Tota Roy Chowdhury in prominent roles. Speaking of the project, Neha Dhupia had told news agency IANS, "Pradeep Sarkar is a wonderful director and I'm extremely excited to work with him. The film is tentatively titled Ela as of now and Kajol plays the protagonist." Eela is being produced by Kajol's husband Ajay Devgn. Kajol will also be seen in a cameo appearance in Shah Rukh Khan's Zero.